DMC’s Emma Broidery has been sharing ideas for Holiday crafting over the last few weeks and a recent post was chock full of embroidery ideas. And the idea was centered around having an ornament party. What a fun plan! Get your friends together and make ornaments for an afternoon. The simple embroidery patterns provided in this blog post will stitch up quickly too and be perfect for such a plan, even for beginners. 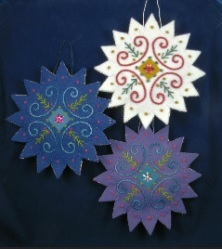 The design shown here is called North Star and is done up in felt and can be done in any colors you like. There are several other patterns provided so head over to see what they look like. Check it out.